I will not tell the story but it is a truly great tale of the evil of Nazism, a couple’s escape from Austria, theft of great works of art, and finally of justice despite immense odds. The New York Times’ reporter Patricia Cohen did a fine job of summarizing the struggles of Maria Altmann to regain a painting of her aunt Adele Bloch-Bauer that was “owned” by the Austrian government as federal property in the Austrian National Gallery.2,3 The painting by Gustav Klimt is considered one of the cultural icons of the country of Austria and a fantastic painting in itself. It was only accidental that I discovered the story. My wife, being of a top-notch judge of good movies, got me to watch Woman in Gold (2015), starring Helen Mirren as the tenacious Altmann. We were glued to the television the entire movie; indeed rare for me. I was taken in by the drama of the juxtaposition of Nazi-era Austria and modern day events that led to the story as we know it. The real story of course is a tale that we should all know for the fear, courage, drama, evil, and justice. What makes Altmann so likeable is her fastidiousness, practicality, intelligence, and most important of all, her gracefulness. The story is about Maria Altmann attempting to recover a long ago stolen portrait by the Nazis from her Jewish family. In the late 1990s Austria and other countries had agreed to restitution efforts when possible. But in the case of this Klimt painting, the government of Austria – considering the cultural value of the painting – resisted Altmann. After many legal battles and the long, frustrating effort to enforce laws that were designed as a “just and fair solution” for Jews and other victims of Nazi persecution, Altmann was able to regain her full rights to the Klimt painting. Interestingly the painting is worth over $100 million but Altmann chose to return the painting to the United States with her but not to profit from it. It currently hangs in the Neue Galerie in Manhattan, New York. Maria Altmann continued to run her small clothing boutique store. She died in 2011 but will forever be remembered as a person with indomitable character. 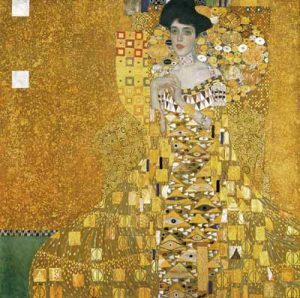 The Gustav Klimt painting is called “Adele Bloch-Bauer I” but the name was changed to “Woman in Gold” to hide its Jewish subject. Ms. Bloch-Bauer’s niece Maria Altmann eventually recovered the painting thanks to the efforts of a young lawyer, Randy Schoenberg and Austrian journalist, Hubertus Czernin.